I love blue inks. The brighter and more vibrant the better. And now I have accumulated a variety of bottles of blue fountain pen inks. And still, do. New blue ink? Buy it, try it and then add almost full bottle it to my ink storage shelf while I move on to sample the next blue ink. If I also consider the wide variety of other colours that I use as well it becomes hard to remember which blue ink is which and how much you like each ink. Sound familiar? Years ago, I developed an ink log in a Rhodia webnotebook. I use this book for trying pens and inks at pen club meetings, recording my fills so I can (try to) remember which ink is in which pen, and keep samples of the colours of inks that I have - loosely organized by colour type- blacks, blues, reds, greens, etc. The disadvantage is that the Rhodia paper is an off-white colour, which does not give an accurate colour representation and that the samples I use are necessarily quite small and inflexible. They are lines on a page. 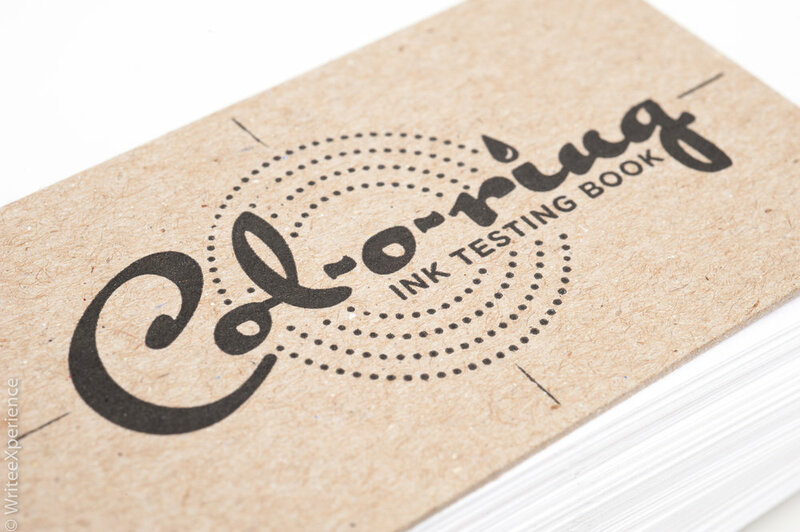 Last year Ana Reinert of the Well Appointed Desk announced the release of the Col-O-Ring swatch booklet, a 100 sheet, ring bound, 4" x 2" ink sample workbook. Unfortunately, Anna does not ship to Canada, but Wonderpens carries the line. I promptly purchased one to catalogue my inks. The book is designed well and is very sturdy for home use. It has a cardboard front and rear cover to protect the ink swatch paper and a quality folding ring closure which makes removing the paper for swatching and organizing your samples very easy. A centre hole in the middle of the top of the paper also makes spreading the swatches convenient. The paper in the Col-O-Ring is a somewhat textured and thicker paper than I would usually write on. It feels more like an art paper than a stationery paper and feels a little rough to my hands. 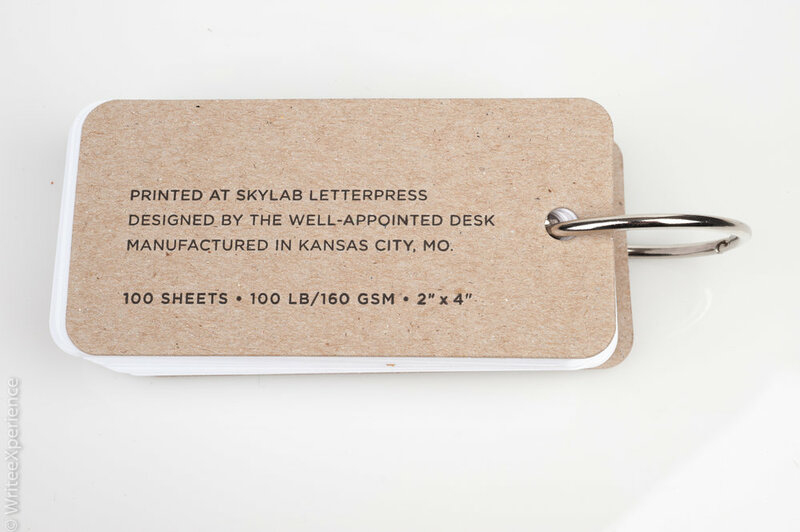 The thickness adds some durability for handling and prevents the paper from curling during wet ink samples, as some stationery papers are prone to do. If I was going to fill out an example for a store or to show to others, I might be tempted to add the circular hole stickers that are available from most stationery supply stores to strengthen the hole and prevent tearing, but not for the average home enthusiast. Despite how functional the Col-O-Ring is, I found myself hesitating to do anything with it. 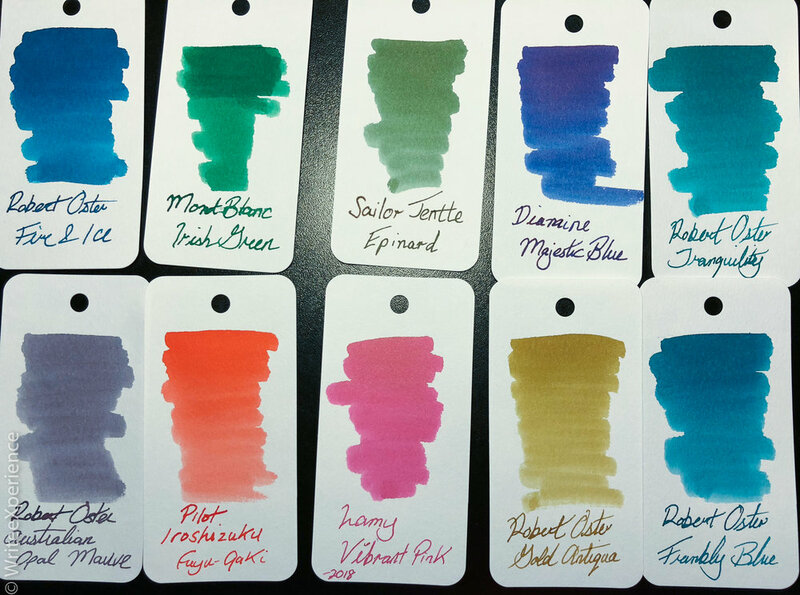 I wasn’t sure how to best make quality ink samples in time and ink use effective way. 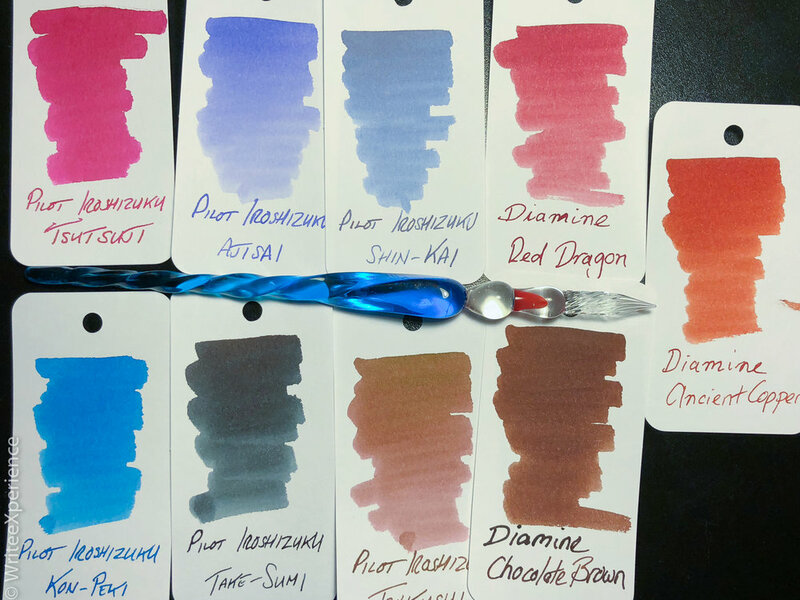 Looking online, it seems that everyone has their techniques for creating beautiful ink samples, and some of those techniques tend to be secret. I eventually tested a couple of ways to make the swatches before I sat down to make them. 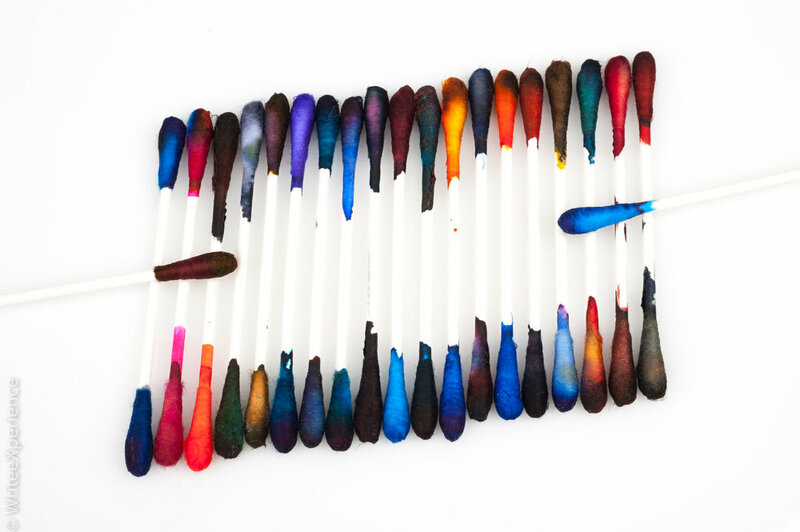 I wanted a relatively quick and easy way to make swabs that is safe for the inks and provided enough variation and consistency to make the Col-O-Ring comparisons meaningful. I also wanted to minimize my cleaning time and avoid possible cross-contamination between inks. I tried a variety of brushes, pens and swabs to see which method met my criteria. The process I chose to make the swabs was quite simple. I used a Q-TIP brand cotton swab, dipped in clean water and then ran the tip over a clean, absorbent paper towel. I did this to ensure that I was not transferring any errant lint from the cotton swab to the ink bottles. I also found that I obtained great ink variance by pre-moistening the Q-tips. I dipped the damp Q-tip directly into the bottle of ink and brushed off any excess ink on the side of the bottle. I placed a single piece of Col-O-Ring blank paper on a desk and applied the inked swab. I started at the top of the paper and moved side to side and down. I did not rotate the Q-tip, instead preferring to replicate the natural variation between wetter and drier ink coats and giving a better idea of the colour variation and shading within the ink. I stopped the ink swap about 2/3 of the way down the page. I stored the still wet q-tips vertically so that I could also use the other side and avoid a puddle of ink in the bottom of my wastebasket. On the bottom of the page, I wrote the manufacturer name and colour of the ink using a J. Herbin glass dip pen. This technique allowed for a rapid turn-around without a lot of cleaning and also permitted a consistent nib width for comparison. The glass nib is thicker than I would typically use and does lay down a thicker line, but the Col-O-Ring is best as an example of the differences between the inks rather than a guarantee of the colour that I will be writing with once filled in a fountain pen and used on different paper. I only catalogue my full ink bottles - and have not yet started on my ink samples and still found this to be a time intensive project. My 60+ samples probably took me over 3 hours to complete. I did them over a few nights, and this was an enjoyable project. I enjoyed making the Col-O-Ring and am happy to have my inks displayed in a way that I can easily compare them. I do like the form factor of the Col-O-Ring to compare inks, and I find it is well constructed. The only downside is that I am not a fan of the paper - the low gloss, textured paper is not particularly smooth in my meaty hands. It feels rough. I do recommend the Col-O-Ring to all fountain pen enthusiasts, even if you have already have an ink sample book. The ease with which you can update and reorganize your ink swabs and the ability to share the book with others makes this a great tool.